There are quite a few “breakfast blends” out there. These are teas that have been blended to “pack a punch” to help you start your day. However, some of these excel in flavor while remaining mild to such an extent that they go beyond breakfast. These blends often contain teas from the Assam, Nilgiri, and Darjeeling tea-growing regions of India, from Kenya and Rwanda in Africa, from Sri Lanka (formerly Ceylon) and Taiwan, and of course Keemun from China. These teas take milk well which is one of the qualities that makes them perfect for breakfast. If you’re the kind who drags a bit in the afternoon, though, these teas will be great choices then, too. For this time of day you may want to enjoy them without the milk and with just a bit of some type of sweetener, such as agave nectar (one I omitted mentioning in my sweetener roundup). You could also steep them a bit lighter so that they won’t be bitter. Breakfast Blend #1 — Assam, Ceylon, and Kenyan teas blended to perfection so that the maltiness of the Assam balances with the sweet Ceylon and the mild Kenyan for a wonderful flavor. Whether you prefer milk or just a bit of lemon, this will perk you up mid-afternoon or even at dinner. Breakfast Blend #2 — Don’t let the name fool you. This tea is quite different from blend #1. For one thing, the leaf pieces are much bigger, meaning that it steeps up a bit milder while #1 steeps up strong and fast. You can also get a couple of infusions from the same batch of leaves. It’s another tea that’s great for both lunch, afternoon teatime, and even dinner. It’s a blend of high-grown Kenyan, Ceylon, and 2nd Flush Assam that pleases. Devonshire Tea — A light-tasting blend of Kenyan teas from four plantations high in the mountains. Great with or without milk. While relatively new on the market, it is quickly becoming a tearoom favorite for that Devonshire Style Cream Tea. Harney and Sons English Breakfast Tea — Ceylon tea adds flavor, Assam gives malty strength, and Kenyan brings out a bright color. It takes milk well and is considered by many to be the ultimate all-day tea. Golden Moon English Breakfast — A blend of Keemun from China with Assam, Ceylon, and a touch of Darjeeling produces a reddish-brown liquid with a flavor that wakes you up. Enjoy with breakfast or any time of day either with milk, straight, or your favorite black tea enhancer. Typhoo Tea — Strong and full of flavor. If you like it straight, just shorten the steeping time from the normal to 5 minutes to 3 minutes or so. Hubby and I steep it by the potful and gulp it with breakfast and lunch. PG Tips — Blended to wake you up, but good anytime. Small wonder it’s the #1 tea in the UK. Bewley’s Irish Breakfast — Assam and Darjeeling combined to produce a creamy, malty, full-bodied taste. Note: They have an Irish Afternoon tea, too, blended from Kenyan and other African teas. Barry’s Irish Breakfast — Kenya and Assam teas that steep up a liquid with pungency, strength and flavor. The moral here is not to let the name limit you. 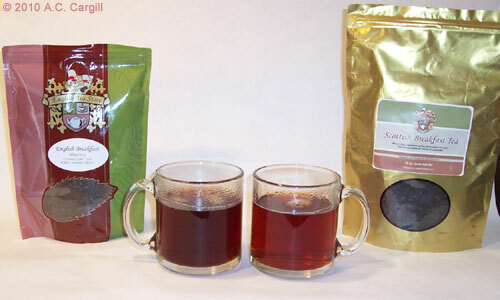 Breakfast teas are great whenever you want a flavorful black tea. Pick one and enjoy it throughout the day.